After what felt like an endless winter, where the only things that could comfort me on a freezing cold Sunday were mashed potatoes and custard (clearly not together), the sun has finally started to come out from behind the clouds and I’m in the mood for some fresh flavours. Basically I need salad. 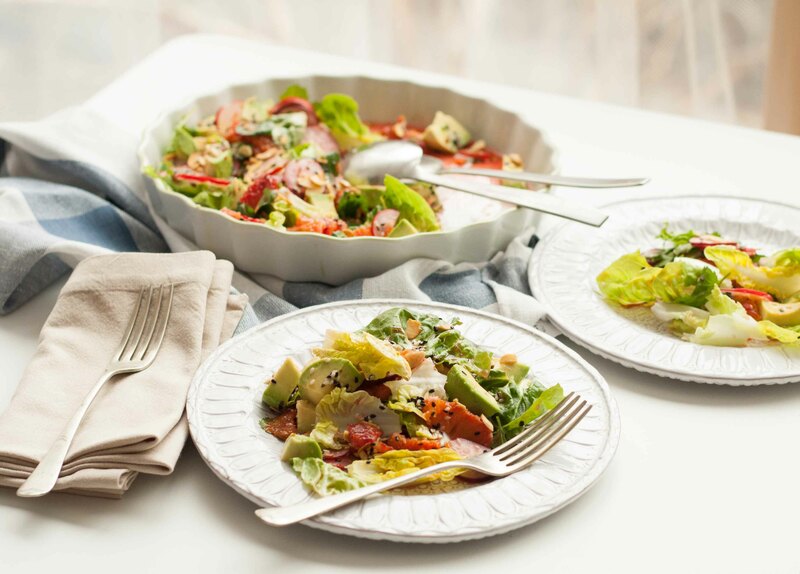 Cool, fresh and crunchy salad, with a gorgeous asian inspired dressing, a little toasted nuttiness and some tangy citrus. Chuck in a few avocado chunks and I’ve found my salad heaven. Plus its another awesome way to make the most of blood orange season, just like this amazing blood orange and campari cake, go on you know you want to! I could eat this salad until the cows come home and this weekend I definitely ate more than my fair share. It makes a perfect light lunch and would be an ideal dinner party starter or barbecue side. I think I might throw a chicken breast on the griddle next time I make it, although my brain keeps steering me towards burgers…naughty brain. 1 avocado, chopped into chunks. Start by toasting the almonds in a dry frying pan over a medium heat. Keep a close eye on them and move them around frequently to stop them catching. Once browned and smelling amazing put them into a small bowl to cool. Next mix up the dressing, either in a little bowl or by shaking all the ingredients together in a jar. Finely slice the radishes and pop them in a bowl with the oranges, coriander and 1/2 the dressing. Mix it up. 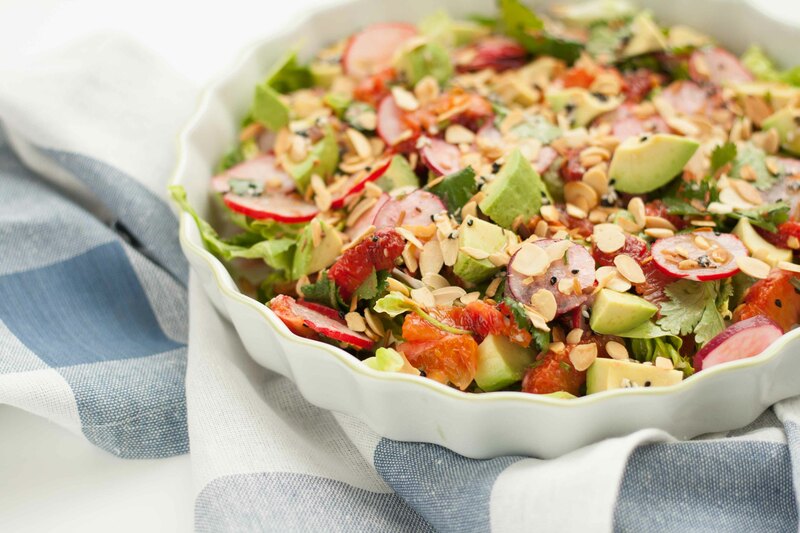 Arrange the lettuce and avocado in a salad bowl, pour over the radish mixture and the remaining dressing, then sprinkle with the toasted almonds. Enjoy!